Sorry if you’re seeing this for a second time. Somehow I clicked the wrong thingy-majobber and this post ended up in a strange place. Whoopsie. This is me trying to fix it. Hope it works this time! My kids and I read Wonder this summer. If you haven’t heard about the book, it’s the story of a boy who was born with a series of genetic mutations which make him look very different. It’s the kind of book that builds empathy, the kind of book that makes the reader believe in the goodness of the humans we share the world with. Wonder nudges the reader to see how they can be a little kinder to others. It also spurred my family to have discussions about who is made in the image of God (everyone). And how does God see those who are made in His image (as His loved children). And how should we treat others, regardless of what they look like (as we’d like to be treated). I thought, “Oh, that’s good, that’s very good”. There’s a lot going on these days, right? A lot of change and a lot of sore wounds being reopened because they never healed right in the first place. Add on top of all the cultural stir-up, the fact that we have 24 hour access to each other. You see it. I do too. People are angry. Some people forget to be kind. Don’t know what I’m talking about? Read the comments section on any news website. But it isn’t just online. I frequent a certain national chain coffee shop. It’s more for the lovely people who work there than anything. It’s like my own “Cheers”. Oh, I just hope I’m not Cliff Clavin. I’m shocked by how downright volatile some get over their coffee. Sure, they paid for it. Sure, they want it made the way they want it made. But there’s no reason to be abusive when there’s more foam than you like or not enough whipped cream (they’re happy to fix the drink, and even happier when the person is respectful about it). A few weeks ago I went through the drive-thru and ordered as I think anyone would…by saying please and thank you and being kind. The barista knew it was me because “it isn’t usual for people to be sweet at the drive-thru”. It isn’t? What makes me saddest/angriest/most embarrassed of all is that the Sunday shift sees the rudest folks in the time slots before and after church. Makes me downright ashamed. Rather, what has gotten out of us? It’s that we forget to be kind. We forget about how that person taking our order is human. We forget that whoever sees our scathing tweet has feelings just like we do. Can we, pretty please, make it a rule? 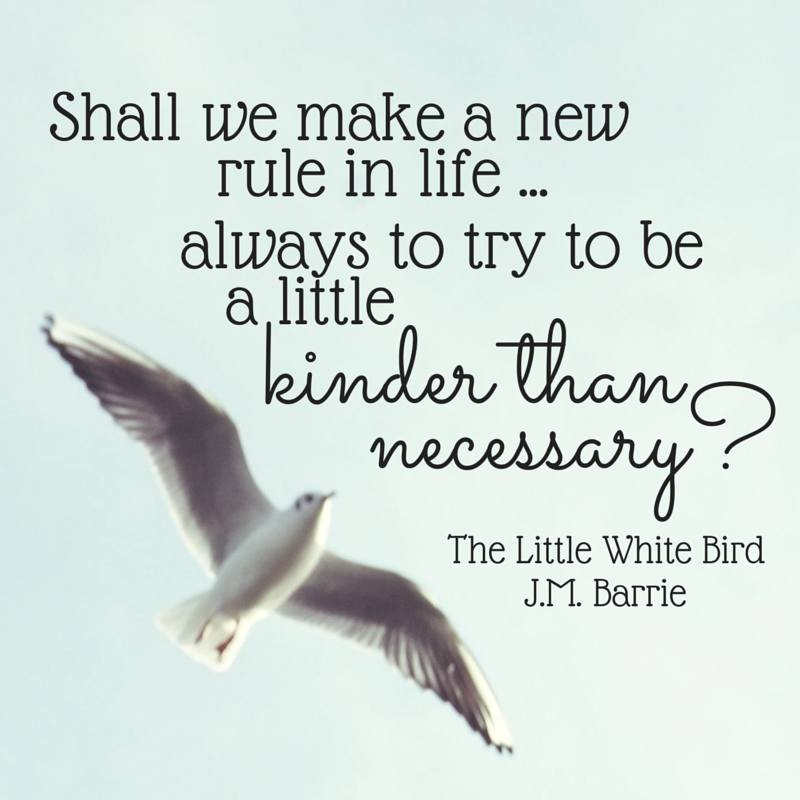 That we should be kinder than we have to be? Make sure to say your “Peas and Q’s” (how my mom reminded us to say please and thank you). Say, “have a nice day” (because it feels good for someone to wish you well). Let someone with a wiggly kid cut in front of you at the checkout line (seriously, I had people do this when my kids were small…it is the KINDEST thing!). Hold the door for the person behind you, offer to help, share words of encouragement (remember that someone with the wiggly kid? They probably could use a little encouragement). Be kind. Be kinder than you have to be. Why? Because it’s the right thing. And because it’s one of the Fruits that ought to be growing on our branches (the Fruit of the Spirit). This kindness will be somewhat of a light, illuminating the Father’s love within us. So, tell me about a time someone was kinder than necessary to you. What are some ideas of ways we can be kind? It seems such an elementary school lesson, but one we all need from time to time. I’d love to hear your ideas! Last week on the day my dad had his stroke, I drove down to Toledo and was able to hold everything together (pretty much)………….until I got to the hospital………………………..and I couldn’t find the elevators that had tenth floor buttons – the ones I found only went to nine. And I called my sister, and was reminded that her phone was dead when it went into voicemail. NONE of the hallways looked like they went anywhere that I needed to be. I finally found a human being in an office at the end of one of those hallways. I went up to the window and waited for her to finish her paperwork. I started, “I can’t find an elevator with a tenth floor…………..and broke down. “My dad had a stroke this morning, and he’s in ICU (sob, sniff) and I can’t find a way to get to him!” The nurse patted my hand, said, “Just a minute, hon”, spoke to her co-worker, came out of her office and ESCORTED ME THROUGH ABOUT a MILE of hallways to the area of the hospital where I was supposed to be. She took me right up to the information desk and made sure I knew where I was going before she left me. That was WAY kinder than she needed to be, and it helped me to avoid a complete melt-down. I thanked her the next day and didn’t really even recognize her. She was KIND – Kinder than she needed to be. But as kind as I needed her to be. God bless that woman! Oh, Debra. This made me cry for about 5 different reasons. I’m so glad she was there to be with you and help you. I love you.